Comment: This book has soft covers. Ex-library, With usual stamps and markings, In fair condition, suitable as a study copy. Please note the Image in this listing is a stock photo and may not match the covers of the actual item. 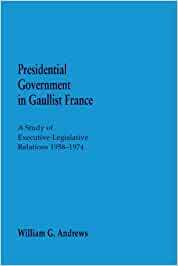 In Presidential Government in Gaullist France, William G. Andrews describes and explains the basic character of executive-legislative relations in Gaullist France from 1958 to 1974. He demonstrates that the Fifth Republic became presidential despite its parliamentary constitution because of changes made by DeGaulle that were compatible with the emergent character of French society. The information is provided in a conceptual framework that gives it greater coherence, explanatory value, and significance. Andrews relates differences in the nature of institutions, of societies, and of political problems to types of power relationships that exist between the legislative and executive branches of government. In order to achieve an objective appraisal of the controversial leader, Andrews fits DeGaulle's constitutional efforts into a broader understanding of the relationships among great leaders, texts, societies, and institutions. The book enhances our understanding of the operation of the Fifth Republic and of French government in general.